I'm old enough to remember the first public awareness of AIDS in the gay community – first the fear and panic, then the extraordinary coming together in the face of tragic loss. I'm also old enough to have lost too many friends to AIDS in those early years, when no one really understood what was going on or why. One of those friends was Roy Salonin, so important to my own coming out all those decades ago in Montreal. Today I honor Roy with this excerpt from my Acts of Surrender memoir. Wherever you are, Roy, thank you! But I also want to honor those more fortunate than Roy, those many have not only survived but have continued to live – and live passionately – with HIV. 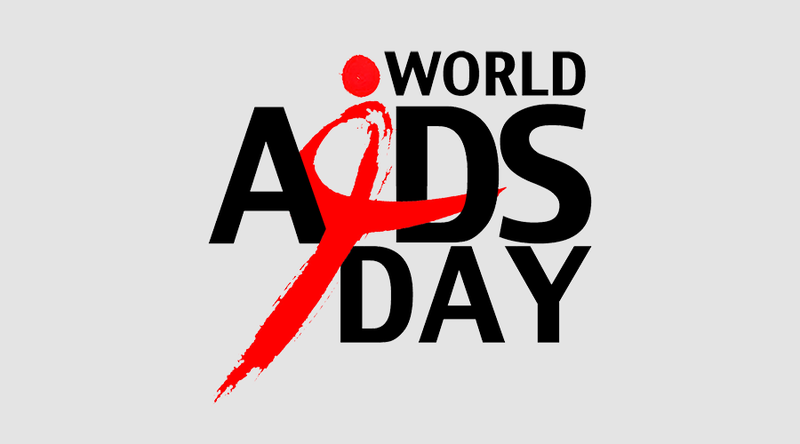 May they always remind us to celebrate life, whatever our age and HIV status...whatever our age and health status. And may they always inspire us to make this the last generation to have to know AIDS. 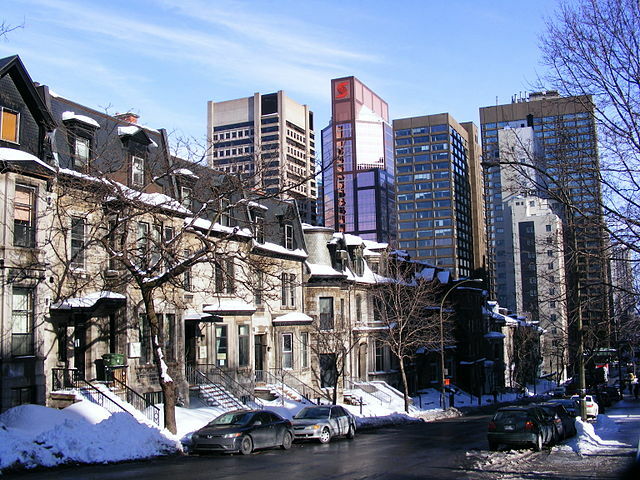 “Good evening, Gay Montreal,” a pleasant male voice answered. “I-I think I’m gay,” I stammered after saying nothing for what seemed decades but was likely little more than a breath. Charles was a pro, expertly navigating me through my fears, reassuring me that I wasn’t alone and inviting me in for a counseling session. Having been born into a generation of Jews with a contemporary knowledge of the Holocaust and firsthand experience of anti-Semitism, I couldn’t help but react inwardly to Charles’s question with a genetic spark of paranoia. Trying to wipe my upbringing from my mind, I nodded. “Then you’ve got to meet Roy Salonin!” he exclaimed. “Roy Salonin. He runs a gay Jewish group. It’s called Naches.” He pronounced it na-kess. Charles scribbled a phone number on a scrap of paper and shoved it across the desk at me. “Call him,” he insisted. Next I knew I was back on Peel Street, Charles having already faded into some recess of my past. Cars pushed past me up the steep hill. Crushes of McGill students swallowed me up and spit me out as they rushed to class. I was oblivious to it all. A gay Jewish group? A gay Jewish group? Called Naches? Talk about chutzpah! Naches is a Yiddish word that expresses the joy a parent only gets from children. For a moment, I wondered how much naches I would bring my mother when I told her I was gay. Only for a moment. With my next breath, I felt calmer and more alive than I had felt in months. A gay Jewish group! For the next eight years, the group that Roy Salonin had helped create formed the cornerstone of my gay experience. I attended weekly meetings and became one of the group’s organizers. I demonstrated with fellow members to protest police raids on gay bars and bathhouses. I wrote provincial and national legislators on behalf of the group to press for equal rights. I manned the Naches booth at the city’s nascent Gay Pride celebrations. I let my name be used in articles in the Montreal Gazette and Canadian Jewish News, then sifted through the resulting answering machine messages — all ugly or obscene. Yet the hateful comments didn’t matter. For the first time in a long time, I felt like I belonged, like I was comfortable with who I was. No one was going to take that away from me. Read more about my many coming out-type experiences – and much more – in Acts of Surrender: A Writer's Memoir, available in paperback and ebook from major online booksellers or signed by me to you from my website. 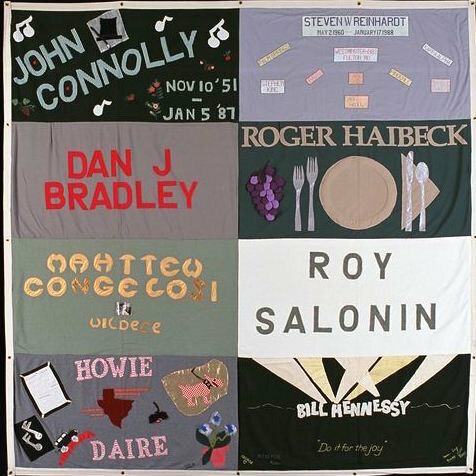 Photos: Roy Salonin's square on the AIDS Memorial Quilt; "Peel Street Golden Square Mile 1" by abdallahh from Montréal. Licensed under Creative Commons Attribution 2.0 via Wikimedia Commons.